Recently completed executive villa on the prestigious Calabay Parc development- only 10 minutes to Disney. 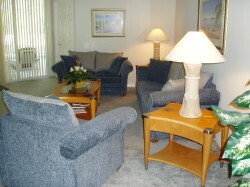 Air conditioned and stylishly furnished. Private heated pool with six person spa/jacuzzi. The recently built villa is fully air-conditioned with two master bedrooms having en-suite facilities of bath, walk � in showers and wardrobes. Both have direct access to the pool area. 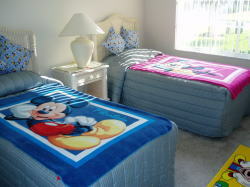 There are a further two twin bedded rooms, one of which is Disney themed. A fully fitted third bathroom is situated adjacent to the bedrooms avoiding �bathroom queues� and ensuring everyone is ready to leave for the Parks at the same time! The villa has cable TV, high-speed wireless Internet access, a DVD player with assorted movies with a Playstation 2 in the den. The kitchen/dining area is fully equipped with a super refrigerator and ice-maker, microwave, large oven/hob, dishwasher, coffee percolator, kettle and much more. All utensils and cutlery are provided including Disney tumblers, dishes and cutlery for the children. There is a separate utility room with large washer, dryer, iron and ironing board. Towels, pool towels, bed linen and hairdryers are also provided. The large living room is beautifully furnished with full views of the pool. A separate sitting room/den contains a sofa bed and TV with Playstation 2. 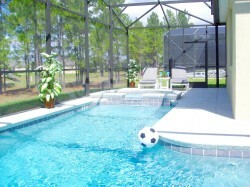 The large swimming pool and spa (seats six) are fully screened and west facing for plenty of sun all day long. The extended deck area accommodates several sun-loungers and the covered lanai has an upgraded patio set for relaxed dining. All in all the perfect spot to chill out in privacy after a day out at the fantastic Orlando attractions.